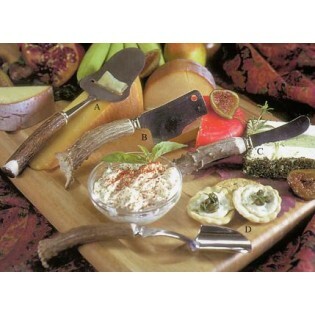 For the "Wine and Cheese Crowd" choose from 4 different antler handled cheese serving accessories. All pieces are made in the USA and available in either crown tip or silver cap. 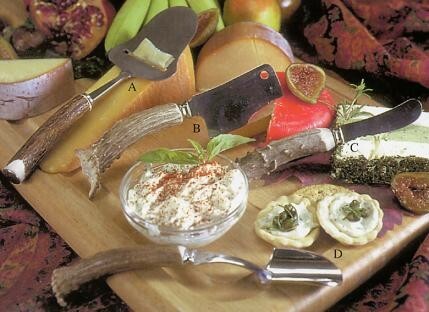 For the "Wine and Cheese Crowd" choose from 4 different antler handled cheese serving accessories: A)cheese planer, B)cheese cleaver, C)canape spreader, D)cheese scoop. All pieces are made in the USA and available in either crown tip or silver cap.